Join us for $10 Pizzas & Happy Hour Specials All Day Sunday! We're making Sunday, fun-day at West Wind Supper Club! We're making Sunday, fun-day at West Wind Supper Club! 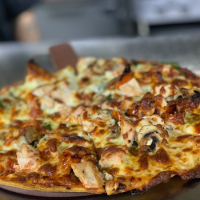 Join us for a 12-inch pizzas featuring our house-made red sauce and your choice of toppings, along with a 16oz tap beer (or soda) for just $10! Plus, it's Happy Hour all day every Sunday at West Wind with the best drink and appetizer specials in town! Make us the place to watch the big game or meet-up with friends and family. website: See our Sunday Happy Hour Special Here! Your Birthday Meal is on Us!